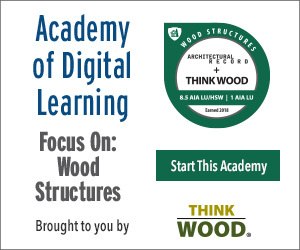 Describe unusual approaches to tall building structures, including exoskeletons. Discuss the potential performance benefits provided by a double facade. Describe some of the structural and human comfort challenges presented by especially slender tall buildings. Discuss resilience strategies suitable for tall buildings and new urban districts, such as cogeneration. Developers, corporations, architects, and clients invariably want to make their mark on the skyline. But as the following projects demonstrate, there is more to designing a good tower. It’s not all about image, or simply gazing up. It’s also about the experience of occupying such structures—with ample daylight and access to views—and how they engage the surrounding environment. A New York residential tower presents a new take on the city’s classic skyscrapers. 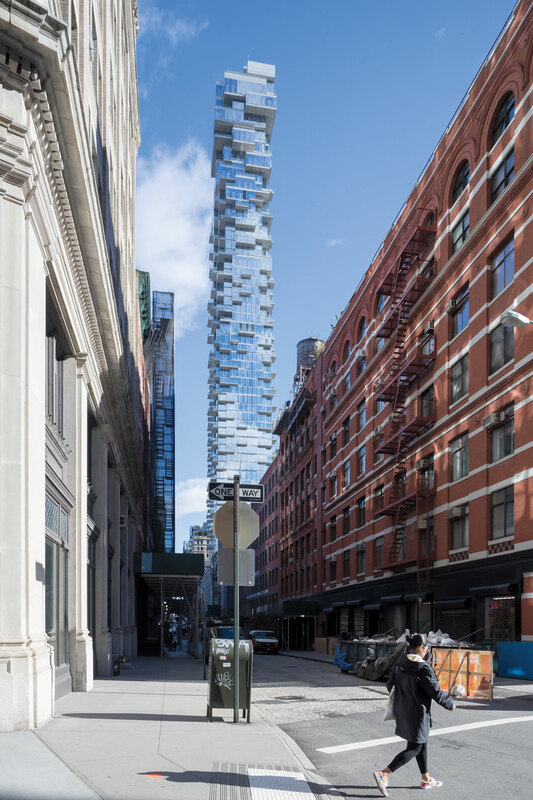 For quite a while, it seemed as if Herzog & de Meuron’s 56 Leonard Street project—a 57-story residential tower in the Tribeca neighborhood of Lower Manhattan—would never get built. For four years during the financial crisis, construction was at a total standstill. But now, nearly a decade after ground was broken, the structure, made up of stacked glass-enclosed volumes and projecting terraces, is almost finished, and residents are starting to move in. 56 Leonard Street, in the Tribeca neighborhood of Lower Manhattan (right), is an assemblage of glass-ensclosed volumes and cantilevering terraces, with the most exuberant projections occurring near its top (left). Ascan Mergenthaler, a Herzog & de Meuron partner, says that the idea behind the unusual cantilevering geometry was not to defy gravity, but to design the units from the inside out and then express the individual apartments and their generous outdoor spaces in the form of the architecture. Although 56 Leonard has been referred to as “Jenga-like” countless times in the press, the result is an assemblage that appears carefully balanced in equilibrium rather than on the verge of toppling over. Its protruding elements recall the famous image of a disembodied hand sliding one apartment into a model of Le Corbusier’s Unité d’Habitation in Marseille, France. 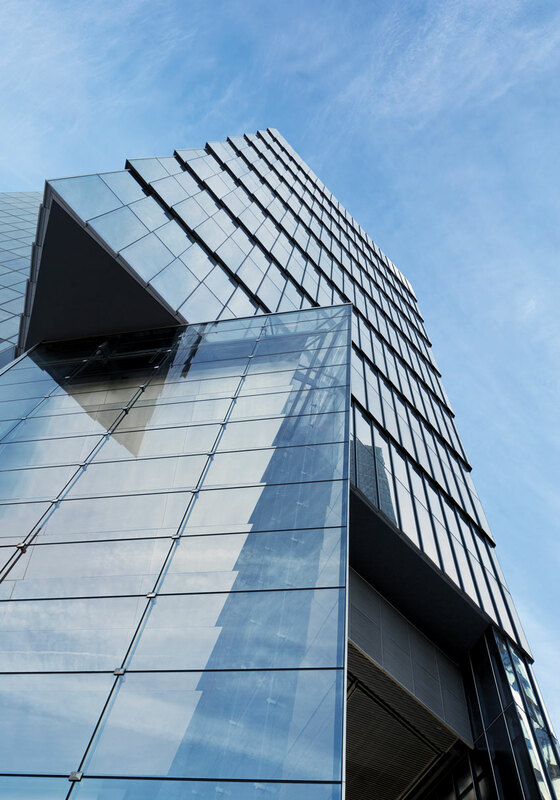 This sensation of pushing and pulling, together with its reflective glass envelope, give the building a compelling chimera-like quality, with features that seem to change depending on one’s vantage point, the weather conditions, or the time of day. The 831-foot-tall reinforced concrete structure (see sidebar, page 96) contains only 145 condominiums, ranging from 650-square-foot studios to penthouse apartments of more than 6,000 square feet. Although no two floors within the building are exactly the same, the unit types are organized into seven zones that can be discerned from the outside if one carefully studies the shift in the patterns of the extending balconies. The most exuberant projections occur near the top. But even if the expressive crown refers to an earlier time of New York’s classical skyscrapers with silhouetted spires, Herzog & de Meuron’s building, which has a width-to-height ratio of about 1:10.5, is also representative of an emerging New York typology. This is the tall, slim, luxury residential tower with spectacular city views. In the case of 56 Leonard, depending on an apartment’s position and orientation within the structure, occupants look out over the surrounding neighborhood and toward the Hudson and East rivers, Wall Street and the World Trade Center, and, in the distance, Midtown. These vistas—as well as views of the tower from elsewhere in Manhattan—could actually remain unobstructed due to the peculiarities of the 12,500-square-­foot parcel, which is surrounded by a mostly low-rise, height-restricted historic district. The 56 Leonard lot, previously owned by the New York Law School, was exempt from these limits. And when the developer, Alexico Group, purchased it in 2006, it also acquired the air rights transferred from the school’s adjacent properties. Views of 56 Leonard should remain unobstructed from the nearby streets (top) since it is surrounded by a height--restricted district. Residents and visitors enter the building through a sober lobby with walls clad in lozenge-shaped black granite tiles (bottom, left). The amenity spaces continue the dark palette. The pool (bottom, right) has black terraz-zo floors, treated to make them slip resistant. It should be noted that Leonard Street’s peers in slenderness, such as the completed 432 Park by Rafael Viñoly, or under-construction towers like SHoP’s 111 West 57th and Jean Nouvel’s 53 West 53rd, have sparked criticism on many fronts. One complaint is that the apartments’ uber-wealthy investors will rarely occupy them, leaving the buildings—most of which are concentrated around the southern end of Central Park—empty and lifeless. Both Herzog & de Meuron and Alexico take pains to distinguish their tower from their uptown super-skinny cousins. The apartments at 56 Leonard “are not safe deposit boxes in the sky,” says Mergenthaler. “The majority of the owners are really living there.” Many of the buyers are moving from elsewhere in Tribeca, says Izak Senbahar, Alexico’s president. He points out that the neighborhood has a paucity of buildings with amenities like those at 56 Leonard, which include parking, a 75-foot-long lap pool, and a movie screening room. Though construction is still not entirely complete, about 45 apartments are already occupied. Most of these residents may well be actual New Yorkers, but they are without question very affluent ones. All except two of 65 Leonard’s units have been sold, fetching an average of $3,250 per square foot, according to one local real-estate publication. All that remains is a 15th-floor one-bedroom, with an asking price of just over $3 million, and a 3,700-square-foot penthouse listed at $17.75 million. Floor-to-ceiling window walls (left) wrap the entire perimeter of every apartment, providing spectacular views, especially from the upper floors. All the units have projecting balconies (right), but none line up with those on the floors above or below. One of the project’s rare missteps is a planned public art piece by Anish Kapoor. As shown in renderings, the sculpture will be an unfortunate adaptation of his beanlike Cloud Gate at Chicago’s Millennium Park. The aim is to help anchor the building to the ground, says Senbahar. But it is hard to imagine how the mirrored sculpture will accomplish that: the piece will be awkwardly lodged under one corner at street level, appearing as though it is slightly deflated from the weight of the structure above. Fortunately, most people will be able to avoid the Kapoor sculpture and admire the building as an arresting addition to Lower Manhattan’s skyline. The basic structural elements for 56 Leonard sound conventional enough: the building has a concrete core and concrete flat-plate slabs supported by concrete columns and shear walls. But though it sounds typical, it was highly challenging to engineer and construct. 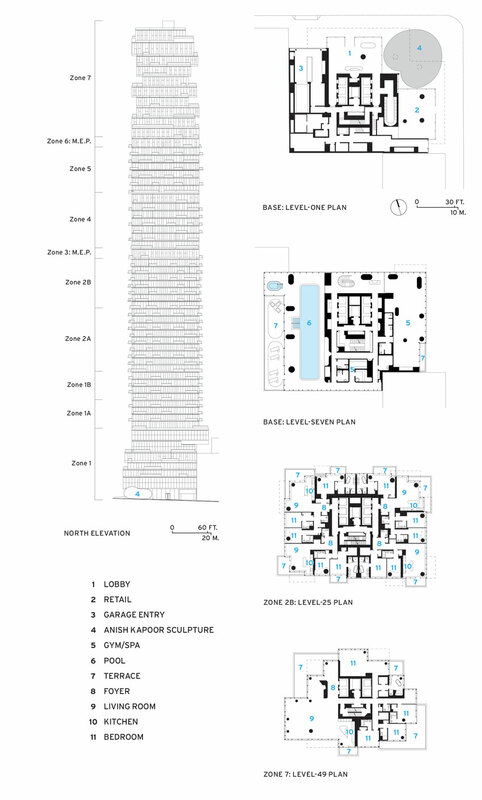 Its scheme of stacked and shifting volumes meant that no two consecutive floors are the same. “It’s a monumental sculpture,” says Silvian Marcus, director of building structures at WSP|Parsons Brinckerhoff, the project’s structural engineer. Because the columns don’t align from level to level, Marcus and his team designed “walking columns.” These are one- or two-story structural walls that transfer loads between floors. To support the building’s many cantilevers, in most cases the engineers used the thickness of the slabs, but for some they added beams. The longest cantilevers—which project as much as 25 feet—required Vierendeel trusses extending over two stories. To significantly increase the rigidity of the structure, the engineers connected the columns to the core at mechanical floors 32 and 46 with outriggers and belt walls that wrap the perimeter. Despite such measures, the slender tower—with an aspect ratio of about 1:10.5—still has a tendency to sway. But it includes a liquid slosh damper at the top. This tank, measuring 32 by 36 feet by 10 feet tall, is filled with water that moves to counteract the sometimes perceptible wind-induced “acceleration.” The device is not a safety or code requirement, says Marcus—it is purely for occupant comfort. “The code does not care about feelings,” he says. J.G.